Home / News / Uncategorized / IDW ANNOUNCES SDCC 2013 EXCLUSIVES! Staggering list has something for everyone, in a record-breaking year! San Diego, CA (July 2, 2013) – IDW Publishing is renowned for having great exclusives at San Diego Comic-Con International every year, but 2013 finds them taking it to the next level. See below for a complete list of SDCC exclusives, which promise to be the most sought after of the show! Some of the items will be available for pre-order from IDW’s web store beginning today, July 2nd. Fans that preorder will be able to pick up their books from the IDW booth (These items will be noted below with an *asterisk). A limited edition product not available anywhere else, the ARTIST’S EDITION: BEST OF EC COVERS PORTFOLIO will be on hand. Featuring eight amazing prints of class EC covers by such luminaries as Frank Frazetta, Wally Wood, Harvey Kurtzman and more, this edition will be limited to 250 copies and priced at $50. It will be available for pre-order from IDW’s web store*, and there is a limit of 3 to a customer. Speaking of EC and Artist’s Editions, an exclusive edition of the BEST OF EC ARTIST’S EDITION will be premiered at Comic-Con as well! Signed by the legendary Al Feldstein, numbered, and limited to 250 copies, this edition will feature a variant cover and be priced at $200. This title will be available for pre-order from IDW’s web store*, and there is a limit of 3 to a customer. That’s not the only big Al Feldstein news at this show. Also debuting is, FELSTEIN: MAD LIFE & FANTASTIC ART. IDW is celebrating the release of this beautiful book with a deluxe, slip-cased version, complete with hand sketches and signatures from Feldstein himself! It will be limited to 100 copies, and be priced at $150, will be available for pre-order from IDW’s web store*, and there is a limit of 3 to a customer. This book is literally at the printer as this is being written, and will be dashed to the show for a last-minute release! AND, there’s another exclusive EC Artist’s Edition this year! ARTIST’S EDITION: JACK DAVIS EC STORIES SIGNED & LIMITED is signed by Jack Davis himself and has a variant cover by the incomparable artist. This edition will be limited to 250 copies and priced at $200. It will be available for pre-order from IDW’s web store*, and there is a limit of 3 to a customer. A special convention exclusive edition of MARK SCHULTZ’S XENOZOIC TALES: ARTIST’S EDITION will also be available, featuring a variant cover by Mark Schultz! This edition is limited to just 250 copies, priced at $200, will be available for pre-order from IDW’s web store*, and there is a limit of 3 to a customer. For My Little Pony fans, IDW has a special surprise! An exclusive glitter variant cover of MY LITTLE PONY: FRIENDSHIP IS MAGIC #9. But, here’s the trick: it contains 8 pages of material that isn’t in the regular edition, featuring the Equestrian Girls! Fans worldwide will be clamoring to get a copy of this, and the ONLY place to read this story is in this exclusive, and the ONLY place to get it is the IDW booth at SDCC! This item is limited to 1,000 copies, with a limit of 5 to a customer. **Note – Watch for the Diamond Comics variant, available to Comics Retailers at SDCC. Our good friends at Skelton Crew Studio have done it again, producing not one, but two new Locke & Key high-quality pewter key replicas! 100 copies of the LOCKE & KEY: SHADOW KEY and 100 copies of the LOCKE & KEY: MUSIC BOX KEY will be available for $25 each, only at IDW’s booth, with a limit of 3 to a customer. THE HOLLOWS VARIANT EDITION HC – Variant cover by Sam Kieth, limited to 200, priced at $25, only available at the IDW booth, limit of 3 to a customer. Get it signed at the show by Chris Ryall and Sam Kieth! WORLDS OF SAM KIETH VARIANT EDITION HC – Variant cover by Sam Kieth, limited to 200, priced at $50, it will be available for pre-order from IDW’s web store*, limit of 3 to a customer. Get it signed at the show by Sam Kieth! THE ROCKETEER: HOLLYWOOD HORROR VARIANT EDITION HC – Variant cover by Walter Simonson, limited to 100, priced at $25, only available at the IDW booth, limit of 3 to a customer. Get it signed at the show by Walter Simonson and Mark Waid! THE ROCKETEER/THE SPIRIT: PULP FRICTION #1 VARIANT – Variant cover by Darwyn Cooke, limited to 500, priced at $5, only available at the IDW booth, limit of 5 to a customer. Get it signed at the show by Mark Waid! X-FILES: SEASON 10 #1 VARIANT – Variant cover by Joe Corroney, limited to 500, priced at $10, only available at the IDW booth, limit of 5 to a customer. Get it signed at the show by X-Files creator Chris Carter, writer Joe Harris and artist Joe Corroney! TEENAGE MUTANT NINJA TURTLES: ARTOBIOGRAPHY VARIANT EDITION HC – Variant cover by Kevin Eastman, limited to 250, priced at $50, it will be available for pre-order from IDW’s web store*, limit of 3 to a customer. Get it signed at the show by Kevin Eastman! Once again, IDW is proud to have Ashley Wood and ThreeA as a part of their booth with exclusives in tow! Ash’s MACHINE SABBATH VARIANT EDITION HC (250 copies available, priced at $25, only available in the booth) and GLITTER SAUSAGE VARIANT EDITION SC (500 copies available, priced at $25, only available in the booth) promise to be exciting additions to the Ashley Wood library. 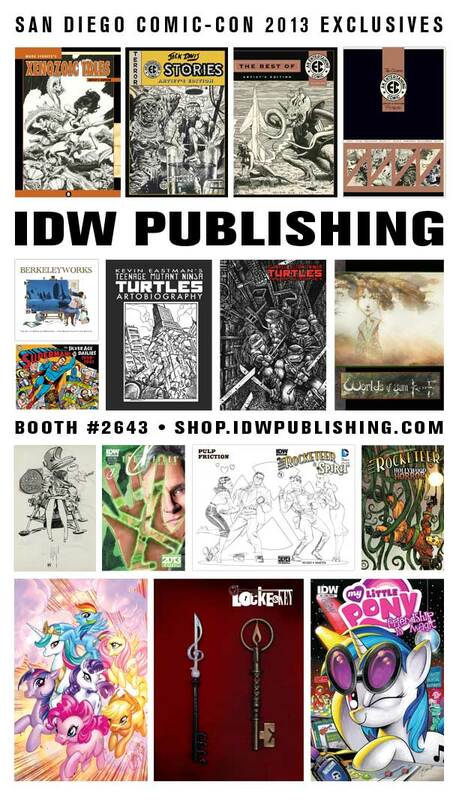 Providing an exclusive suitable for each and every fan in the building, the IDW Booth promises to be the place to be at this year’s Comic-Con International!